'No Shirt - No Shoes - No Problem!' Whether it's for a beachside house, condo or villa, you or the recipient you give this to will love adding our personalized beach-themed sign to the bar or veranda area. Features a gorgeous beach scene with an adirondack chair and proudly makes the rules of relaxed living clear. 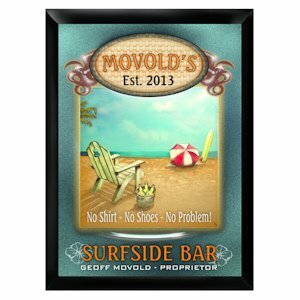 Provide the first name, last name and year the Surfside Bar was established to create a customized pub sign.